Some dried leaves last and last. On most horticultural sites, you get pictures of beautiful flowers and handsome plants. Here at Sinningia and Friends, you get... dead leaves! A few years ago, I started noticing that some sinningia leaves defied tradition. 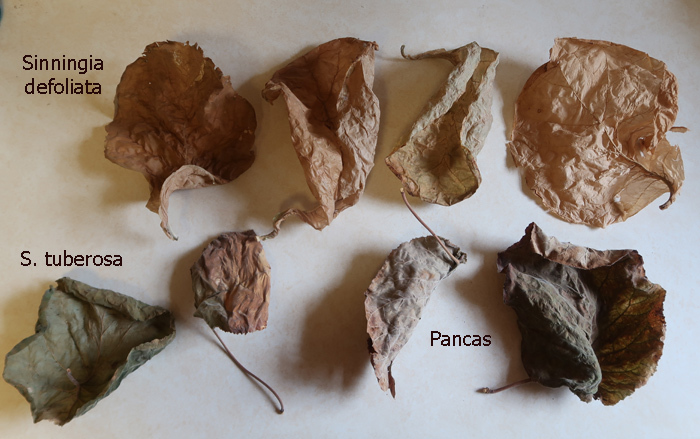 Instead of disintegrating at the end of their cycle, the leaves of Sinningia defoliata dried up but remained intact (although fragile). I now have leaves up to three years old which have not decayed. At first I attributed this durability to the waxiness of the leaves, which protected them from normal decay. Now I have noticed the same effect in two other species, which do not have especially waxy leaves: Sinningia stapelioides and Sinningia tuberosa. The picture above shows 4 leaves of S. defoliata (top row), 1 of S. tuberosa (bottom row, left end), and 3 of S. stapelioides (formerly "Pancas") (remainder of bottom row).